Learn the difference between baking soda and baking powder and what to do in a pinch if you do not have one on hand! While baking soda and baking powder serve the same main function, the way in which they work to make a baked good rise is different. Baking soda, also sometimes referred to as “sodium bicarb,” is just plain sodium bicarbonate. On the ph scale, it is considered a basic. In order for it to do it’s job of leavening your baked good, it needs an acidic component to react with. When the basic properties of baking soda mix with the acidic properties of another ingredient the baking soda works to neutralize the acid and this is what causes the air bubbles (carbon dioxide) that leaven the baked good. In baking, the usual acidic components include: buttermilk, brown sugar, molasses, vinegar, yogurt, lemon juice (or other citrus juice), natural cocoa powder (dutch processed cocoa powder is not acidic), and chocolate. Baking soda is ideal to be used instead of baking powder if there is an acidic component because it is about four times more effective than baking powder. Baking Powder is baking soda (sodium bicarbonate) that is already mixed with an acidic ingredients. Therefore, baking powder can be used on its own to leaven baked goods without the need for an acidic ingredient. Baking powder works in the same way that baking soda does by creating air bubbles (carbon dioxide) which cause the baked good to rise. Most baking powders these days are also “double acting” which means that they actually contain two types of acids, one that reacts when it is hydrated and the other that reacts to the heat of the oven. Baking powder is about four times weaker than baking soda and it does have a shelf life. Pay attention to the expiration date. If you are in doubt if your baking powder is still good, you can test it. To test if your baking powder or baking soda is still active, add a teaspoon to about 1 cup of hot water. If it is still fresh, it will start bubbling quite a bit. If it does not bubble, throw it out and get a new container. Why Do Some Recipes Use Both Baking Soda and Baking Powder? Recipes that call for both baking soda and baking powder usually have to do with the fact that the recipe contains acid that needs to be neutralized by the baking soda, but possibly not enough to do the amount of leavening desired. The baking powder picks up the slack. Additionally, since baking powder is double acting, it gives even more rise to the baked good. Because baking is a science, it is not ideal to substitute baking soda and baking powder in most recipes. However, if you understand how the two interact, there are some ways to substitute for either if absolutely needed. If your recipe calls for baking soda and you do not have any on hand, you can substitute the baking soda with baking powder. Increase the amount of baking powder by four times the amount of baking soda called for in the recipe. If your recipe calls for baking powder and you do not have any you can actually create your own baking powder substitute if you have baking soda and cream of tartar on hand. Mix baking soda and cream of tartar together at a 1:2 ratio. One part baking soda to two parts cream of tartar equals a baking powder substitute. If you do not have cream of tartar on hand and your recipe has an acidic ingredient present, then you can substitute the baking soda for baking powder. Use 1/4 the amount of baking soda than the amount of baking powder called for in the recipe. Note that per 1/4 tsp of baking soda you need ample amount of acidity which is about 1 cup of buttermilk, 1 cup of brown sugar, 1 teaspoon of lemon juice, or 1 teaspoon of vinegar. If, for some reason, you are unable to use baking soda or baking powder, then there are a few things you can try. First, think about how important the rise is of this baked good. Is it extremely important, as in for a cake or biscuits, or is it okay if the end result is a little more flat than usual, like a cookie? If the rise of the baked good isn’t extremely important, then you can try the recipe without the baking soda or baking powder. I have had a lot of success with making cookies without baking soda or baking powder. 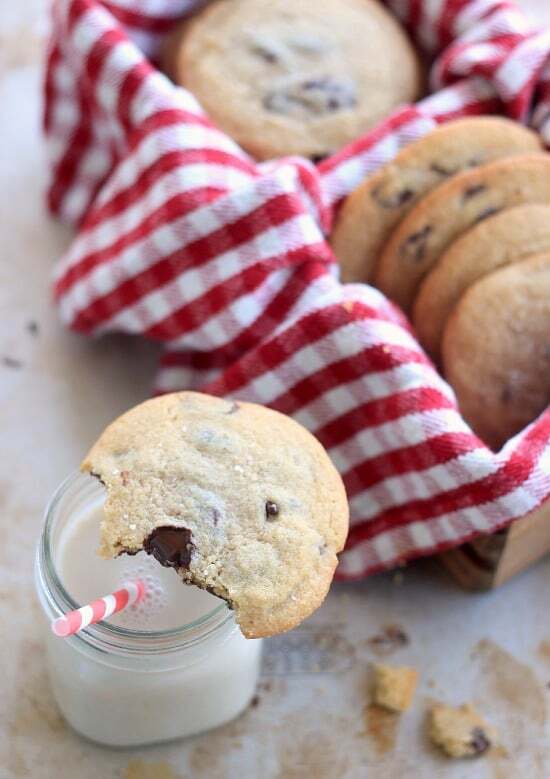 These chocolate chip cookies are one of my favorites. If the recipe calls for eggs and you need to make it without baking soda or baking powder, try separating the eggs and whip the egg whites to medium peaks. Fold the egg whites in as the very last step of combining the batter. The egg whites while lighten the batter and help it to rise. Note that this will not work for a very stiff dough. Only for batters. 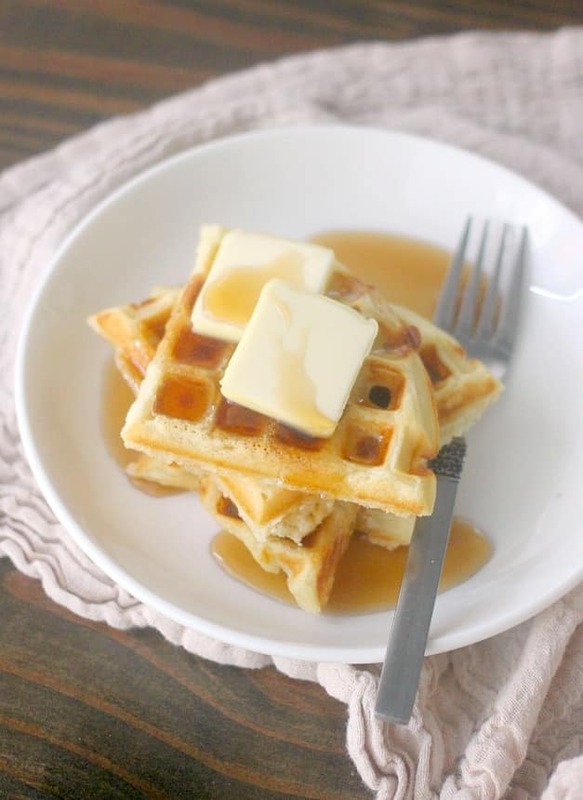 This technique is what I used to make my pancakes without baking powder and for my quick bread without baking soda or baking powder. 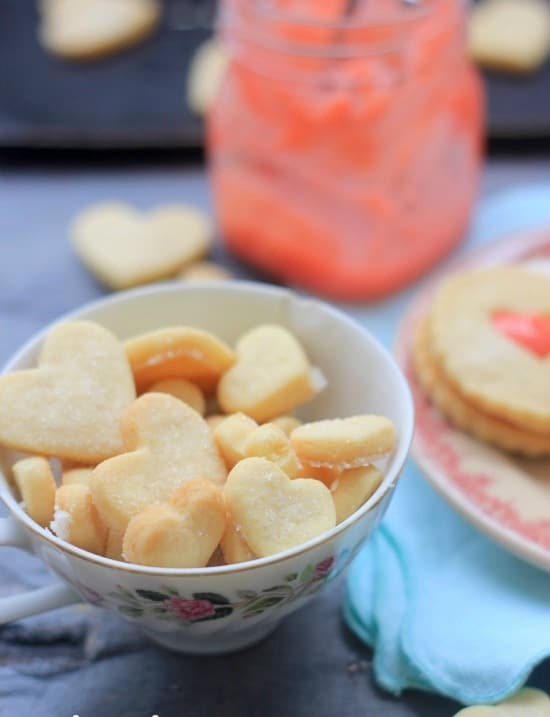 Below are more of my favorites recipes that can be made without baking soda or baking powder! I started making Russian pound cake and mistakenly put baking soda where it called for baking powder. Now what do I do? Well having read your article, I now know that baking soda needs an acid, so instead of throwing the whole thing out I am going to add lemon juice and see if that works. I will let you know how it turns out. It actually came turned out pretty darn good. Maybe not as soft and bubbly textured as it is supposed to be, but you know what I am pretty happy with the result. In recipe 1 tsp of baking powder and 1/2 tsp of baking soda I don’t want to add the baking soda. Then how many I add baking powder? ?? Great Article! Definitely helped me understand what I was looking for. I do have a question though. I came across an old cookie recipe and was confused by the fact that the ingredients only listed 1/2 tsp of baking soda and no cream of tartar or baking powder. And there doesn’t seem to be any acidic ingredient to activate the baking soda (Ingredients: All-Purpose Flour, Sugar, Baking Soda, Eggs, Shortening, Salt and Almond Extract). Was an ingredient left out? Should I add 1/4 tsp of cream of tartar or swap out baking soda for 1 tsp of baking powder? How old is the recipe? There could be several reasons for this. 1) It might just be a bad recipe with incorrect ingredients. 2) If it is a really old recipe (like 1800’s old) it was common knowledge for the home cook to add something acidic when using baking soda. The choice was up the baker about what to use. 3) Baking soda also greatly affects browning of a baked good. It is possible that the cookie isn’t meant to rise but the baking soda is for the purposes of browning. It's a little denser than most pound cakes I have taste, but not bad. I think if I put more acid in the mix it would have been fluffier. It tasted great however and will definitely get eaten. Will peanutbutter cookies turn out good if I don’t use either bakin soda or powder ? .. If I had a little more egg maybe that will help ?.. What would happen if you were baking bread and used baking soda, but added acid, (science experiment- not to eat!)…. Would this cause a reaction with the baking soda? It sounds like some people do add vinegar to bread to get it to rise to new heights. I also discovered if I use an excess of baking soda that my baked goods will rise and then fall and be sunken in the center. I want to bake a carrot cake without using egg and my recipe calls for both baking powder and baking soda. Understood that i can substitute baking soda with 3 times that of baking powder, however, since no egg is used in my recipe it calls for curd to be used(which is acidic), please do let me know would that hamper the taste of the cake? It really depends on what else is in the recipe. Do you mind telling me what the other ingredients are? Do you have buttermilk? Or anything acidic you can add to your milk? Such as a little lemon juice or white vinegar? Something acidic will activate your baking soda. It may not turn out exactly as the original recipe, but you can always try that! I too don’t have baking powder, but I do have baking soda. I made some apple muffins with soda instead but I didn’t realise about the acid so they were as flat as pancakes! I’ve still got 50% of the mix in the fridge, you say add a little lemon, how much is that, a teaspoon? Is it also true you have to use it straight away or the soda goes flat? So should I add another teaspoon of soda too? It’s for 12 muffins. If i put in 2 and 1 half teaspoons of baking soda instead of baking powder in a cake recipe and caught my misstate so I added the 2 1/2 teaspoons of baking powder…will the cake be ok or do I need to add something else to balance out the baking soda…Help!!!! Love your website! I stumbled across it when we suddenly had a craving for oatmeal cookies, but had limited ingredients, and your 6 ingredient oatmeal cookies are great! Very easy. 🙂 Thanks for making this page exist. I’m so glad you found me Nicole! Happy to have you here! This is the best baking website ever. I go on food sites once in awhile but some people act like we should know cause they do and some are just so detached from their audiences. You seem to be so clear with your directions / instructions that it makes it so much easier and just more relaxed. I don’t think ,”oh no, was I supposed to do it like this, or like that?” Making everything worse and more stressful than it has to be. But with you I don’t do that because your recipes are clear. I know I did it right and am confident because you clearly write it to where the worse bakers get it!! This site is very helpful.But it’ll be really good if you can help me with one of my queries.For a getting a moist cake along with a pretty good rise if I use buttermilk with baking soda along with a pinch of baking powder , can I use condensed milk or normal milk for its extra added softness? I mean is it wise to use condensed milk and buttermilk at the same time for a rick chocolate cake? Hi Christina! There are a few things that effect deciding which to use. Baking soda always has to be used in conjunction with an acidic ingredient or it will not do anything in the recipe. However, depending on how much acidity in the recipe there is, it might need some help from baking powder to do a little more lifting. Baking soda will also neutralize the flavor the acidic ingredients so sometimes baking powder is opted for instead of baking soda because the tangy acidic flavor is desired in the recipe. So the cake that used baking powder will likely taste slightly more acidic than the cake made with baking soda only. I would guess by reading those ingredients that the flavor difference isn’t significant though. Baking soda is also much more powerful that baking powder and some people prefer using it when they can because they claim they can taste the baking powder in a recipe since you must use much more of it. 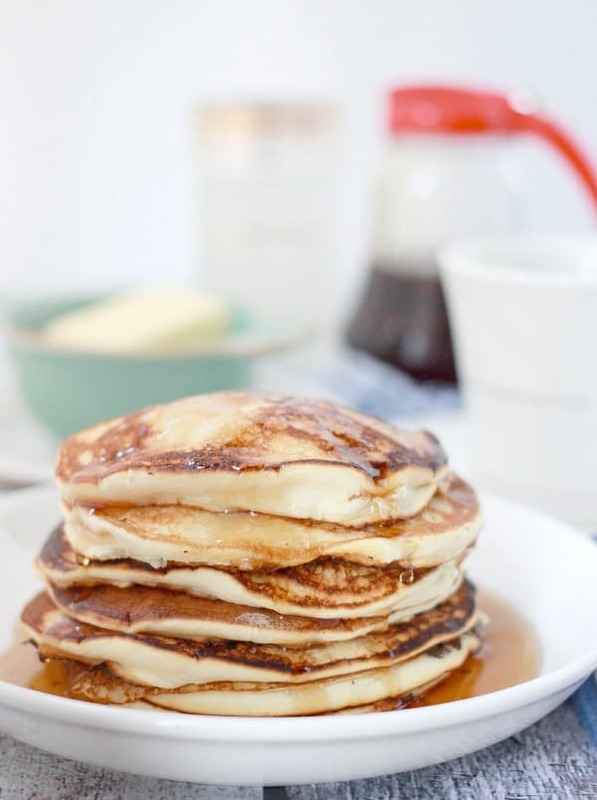 Pingback: How To Make Pancake Mix Without Baking Powder And Baking Soda | Bau Kelek Woy!!! IN RECIPE THERE IS 1 TEASPOON BAKING POWDER AND 1/2 TEASPOON OF BAKING SODA I DON’T WANT TO ADD BAKING SODA. THEN HOW MANY I ADD BAKING POWDER????? it’s always hard to see someone share what they know, their knowledge with others, am really grateful and thankful ,you are the best. Thank you Maryann! I’m so glad you find the information useful! I bake coconut bread where I add coconut flakes and coconut milk to the mixture. I use baking powder. I also beat the egg whites till stiff and fold them into the batter. The cakes are delicious but they crumble when you cut them. How do I stop the crumbling? I thought I should maybe add more flour and add the whole egg instead of beating the egg whites. What would you suggest? Maybe add more eggs? Hi Fay! Do you have a link to the recipe? It’s hard for me to know what might be the issue without seeing it. Make sure you aren’t beating the egg whites to the points where they look dry. If you beat them too much it could cause a crumbly cake. You could also try reducing the flour a bit. Also make sure you use a very sharp serrated knife to cut them! I also bake banana breads which are nice and moist. I sell mini loaves and they are very popular. They are considered better than most. I do puree the bananas and add buttermilk, vinegar, baking soda and water. Would I be able to add baking powder to give them extra height? I have been baking these for over 30 years. Yes, you definitely could. Start with a small amount and then you can increase it a little until you get what you are looking for! I made muffins from this website (https://cookieandkate.com/2014/healthy-maple-pumpkin-muffins/) and I found the taste was overwhelmed by too much baking soda. Even when making it, I was like that seems like a lot of baking soda for only 12 muffins! It was just a feeling. So my question is, how do you alter a recipe to get rid of the baking soda smell/taste. My son (who is 3) still loves the muffins and will eat them regardless, but it bothers me enough that when I make them again, I want to try something different. My impulse is to change out half the baking soda with baking powder. Would that do anything to help do you think? Hi Anna! The thing about baking soda is that it needs enough of an acidic ingredient to interact with to neautralize the soda so that you don’t taste it. 1 tsp is quite a lot of baking soda compared to the 1/2 cup of honey or maple syrup which is the acidic ingredient in the recipe. I would guess you would only want about 1/4 tsp or 1/2 tsp in the recipe and if they need a little more lift you could add some baking powder to the recipe. 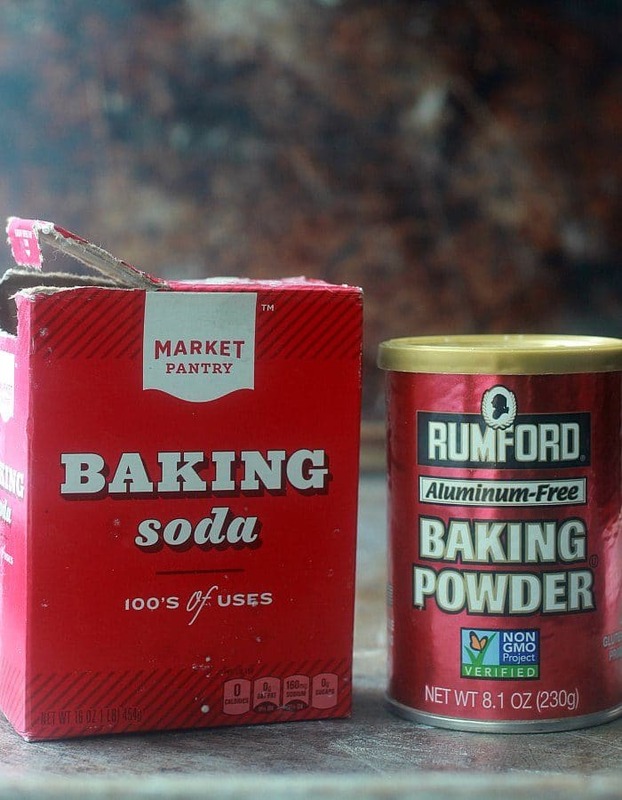 Baking soda is about 3-4 times more powerful than baking powder. But I would guess a lot of the soda in this recipe probably isn’t doing anything because there isn’t enough acid. I would suggest cut the soda down to 1/2 tsp and add 1 tsp of baking powder. Hope that helps! Trying g to make a vegan pizza dough without baking powder or b. Soda , do you have a recipe? Hi Peggy! Traditional pizza dough is already vegan and doesn’t include baking powder or baking soda. You can use my easy recipe here: https://bakerbettie.com/game-day-gourmet-homemade-pizza/ Let me know if you have any questions! I FOUND IT VERY EXPLICIT AND EASY TO FOLLOW. I KNEW THE OLD METHOD BUT I USE SODA AND YOGURT WHICH I ALWAYS HAVE. IS THE AMOUNT OF GREEK YOGURT ABOUT HALF THAT OF BUTTERMILK. MY PROBLEM WAS WITH YEAST I CANNOT USE, THANKS FOR THE ALTERNATIVE. I SHOULD SAY I AM NOT A REGULAR BAKER NOW I AM GLUTEN FREE. MARY. Typically if I substitute greek yogurt for buttermilk I use about 3/4 cup greek yogurt mixed with 1/4 cup of water for every 1 cup of buttermilk. I hope that helps! I’m glad you enjoyed the article!